What to Expect in Terms of Features? Even if you are passionate about CB radios, you’re probably not willing to spend hours or even days searching for the best one. The main reason is that the information about good CB radios is pretty scarce. This is why we’ve decided to help you out by presenting you with our Stryker SR-955HPC review. This CB radio might not be the very best one you can find, but it’s not far off. Stryker SR-955HPC seems to have all the features you need, but the best thing about it is that its price is pretty reasonable. So, with no further ado, let’s start discussing its specs. When it comes to CB radios, you’ll be hard-pressed to find a more reliable option than the Stryker SR-955HPC. Regardless of whether you’re a novice or a veteran when it comes to CB radios, this unit has pretty much everything you’ll ever need. I’m talking excellent power output, single sideband clarity, unparalleled frequency stability, and a high number of useful features to complete the package. In addition, the Stryker SR-955HPC is also a very well-designed product with a unique look that easily allows it to stand out from the crowd. 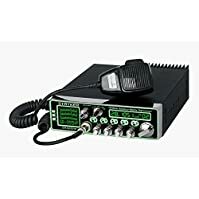 Stryker CB radio reviews often praise the company but this particular unit is definitely in a league of its own. Want to learn more about this CB radio? Well, don’t worry because I’ve got you covered. Just read our Stryker SR-955HPC review down below to find out if this CB radio is what you were looking for. The Stryker SR-955HPC comes equipped with a slew of great features, including high-performance SSB operation and excellent AM audio quality. The 10-meter radio also includes an LED backlit faceplate with seven different colors to choose from. The colors vary in terms of intensity, which allows operators to adjust the lighting accordingly depending on the time of day they are driving. Looking for a lightweight CB radio? Well, you just found it because the Stryker SR-955HPC only weights around six pounds. Not only is it very light, but the radio is also compact so you won’t have any trouble finding a suitable place for it in your car. This is a great radio for both amplitude modulation (AM) and single-sideband modulation (SSB). Actually, Stryker SR-955HPC is pretty unique, considering the fact that there are no other similarly priced radios that offer SSB. When it comes to the built-in mike, you can expect excellent quality and very crisp sound. In other words, you won’t need to get a power mike to go along with the radio because it already offers a very good one. While not technically a CB radio out of the box, the Stryker SR-955HPC can easily access CB channels with a few simple modifications. The Stryker SR-955HPC runs on a very straightforward piece of software based on Windows 7 64-bit. The software comes with a number of nifty features like power safety control and SWR cut off. You can also use the software to customize and assign certain channel frequencies to each band. The radio is pretty quiet right off the bat but you can make it even quieter by cranking up the RF gain. Most of the radios you could find prior to the release of the Stryker SR-955HPC either worked well on AM or SSB but never both. Thanks to this radio, operators can now finally experience good performance on both AM and SSB, as well as FM. The 60+ watts PEP output of the Stryker SR-955HPC allows for crystal clear signal reception. You can also expect a high degree of customization with this radio. An example is that you’re allowed to choose between various roger beeps by pressing a front panel switch. This radio has a lot to offer in terms of audio quality and performance. Stryker SR-955HPC is a very reliable unit with a really high power output. It also has a slew of features that puts most of its competitors to shame. Even better, the easy-to-use software allows you to customize many of the radio’s features. As mentioned, you get good performance on not only AM/FM but SSB as well. This is not something you often see on a radio as affordable as this one. A minor gripe I have with this unit is that it doesn’t allow you to set a custom roger beep. There are a few standard roger beeps to choose from but a custom one would have been nice regardless. Stryker SR-955HPC is one of the best-rated CB radios on Amazon. Customers seem to love everything about this product, including the fact that it can work on AM, FM, and SSB. Of course, there’s also the fairly low price. Most users agree that finding a radio that’s a better bang for the buck is almost impossible. While the product is very nicely designed, the manufacturer could have spent a bit more time to polish it properly. The radio does look good at a first glance, there’s no arguing about that. Still, if you look a bit closer, you’ll find that the finishing is not top quality. The Stryker SR-955HPC is reliable, affordable, and comes with many useful features. Truth be told, there are a few minor drawbacks here and there. But, despite that, this is a very versatile radio that will not let you down. As I mentioned before, you will need to make a few modifications in order to use it as a full-fledged CB radio. The good news is that the process is quite simple. All in all, the Stryker SR-955HPC is definitely a steal. We can wholeheartedly recommend it to anyone looking for a quality radio that offers both AM and SSB functions.